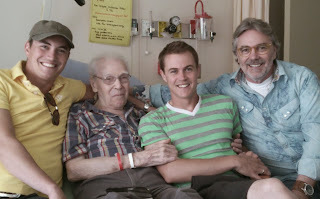 My dad died this morning. He was 96, unable to eat or drink. He was eager and ready to go. Our family has been blessed by the man he was, by the way he lived and by the way he died. His two children (and my wife Vicki) were there at his side as he crossed over to be with the person who meant most to him. Our mom came for him almost two years to the day that she died. Dad was one of our many blessings. For this and for all my blessings, I am thankful.